With cold weather crops well on their way to freedom, and by freedom I mean transplanting into the ground, I’ve got cruciferous veggies on the brain! Cauliflower is a nutrient rich vegetable that seems to really puzzle people when it comes to using it. If you are one of those individuals, fear not, I’ve got the perfect recipe for you! Preheat oven to 400. 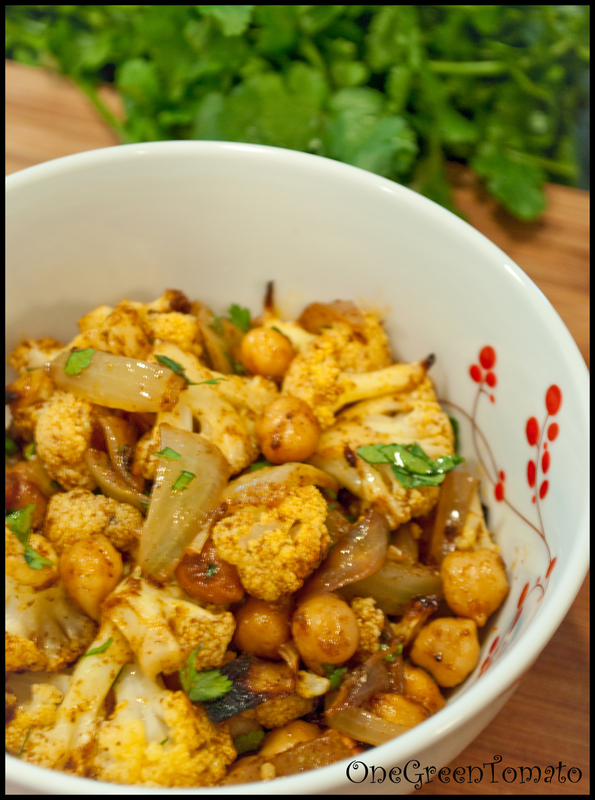 Place cauliflower, onion and chickpeas into an ungreased 9×13 baking dish, set aside. Mix vinaigrette by whisking together the remaining ingredients, except for cilantro. Pour over veggies and mix well. I found that rolling up my sleeves and using my hands was the best way to coat everything. My wooden spoons seem to work against me at times and encourage those veggies to jump out of the dish! Place the dish in the oven and bake uncovered for 25-30 minutes or until the cauliflower is fork-tender. Sprinkle chopped cilantro on top and enjoy! This sounds and looks delicous. this looks fantastic and supereasy. i love curried veggies. thanks for sharing!